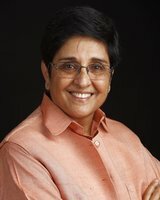 Kiran Bedi 9 June 1949 Indian Prakash Peshawaria Prem Peshawaria Police officer, Politician, Film producer, Civil rights activist India's first and highest (woman) ranking officer who joined the Indian Police Service in 1972. Her expertise includes more than 35 years of creative and reformative policing and prison management. A list of popular Hindi Kiran Bedi quotes are given below.